ZEBRONICS is an Indian brand which was established in 1997 and has headquarters in Chennai.It is one of the leading brand in India computer peripheral market.Due to its affordability(cheap) and innovative and creative design it is giving tough completion to some leading global brands in Indian market. Zebronics is known for their outstanding features they provide at affordable price and are in the reach of common man. On Monday,Zebronics has announced version 2 of Zeb Juke Bar which comes with inbuilt FM,wireless Bluetooth,USB,SD/MMC connectivity for the compatibility to various inputs.It also support mp3/WMA directly from USB. 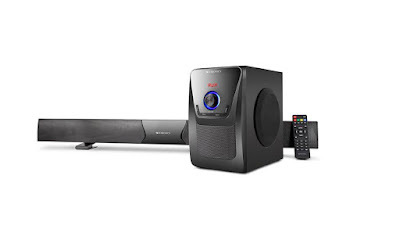 All this magnificent features comes at tempting price Rs.4949 which makes it one of the best sound bars in this range. As mentioned earlier,Zebronics is known for their creative design,they have again proved it right by the superb design of this newly launched sound bars.They have taken minute care for the style and design of Juke Bar 2.It has glossy front panel and has a slim design profile with matte-black finish. They have also provided with a LED touch screen display to go broadcast through menu option and access it which is an icing on the cake. To enhance the base sound they have also provided subwoofer.The built in bass enhancer brings the rich deep sounds and powerful sound effect which refreshes our mood and make us energetic. It has 7.62cm mid/high range driver and 12.7 cm low range driver to give 40 watts RMS audio output. JUKE BAR 2 is fully remote controlled to enhance the user experience.It comes with one year warranty and is available at all leading stores across India. ZEBRONICS has taken home theater experience to a new level with the innovative technology,sleek design,best quality and by its affordable price. Because of all these features only Zebronics are the best emerging brand in Indian market which has received more than 48 industry award.